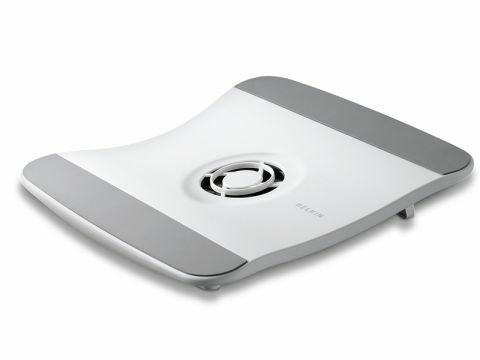 The Belkin Cooling Stand has a simple but elegant design that uses a single fan to draw the warm air away from your laptop. It has a simple wave design that sits on small feet. This helps air to circulate underneath and around the base of your laptop. You'll ﬁnd a small storage space at the back of the board for tidying away your power cable and leads. The fan is powered by USB through your laptop and we found it ran quietly, keeping our test machine cool. The problem we found was the stand's size. It has been designed to work with 15-inch laptops and below, so won't suit desktop replacements at all. We also found our 15.4-inch machine less than stable when resting on the stand. If you have a reasonably small laptop you'll like this stand, but it won't suit larger laptops.